The demanding activities and tasks at the workplace and the lifting of heavy objects at home, causes pain in the back and neck region of the body, which if not treated appropriately, can result in serious disc injuries. Thoracic spine herniation is a medical condition, for which chiropractic offers effective treatment methods. What Is Thoracic Disc Herniation? Thoracic disc herniation is a type of disc injury in which the upper back region of the body is affected and a tingling pain permeates throughout the affected area. In some cases, the patient might feel pain in his chest and rib cage, which might be because of the pressure exerted on the nerves in the area. The thoracic spine of the body consists of 12 vertebra, referred to by doctors as T1 to T12. The thoracic spine begins at the base of the neck, and continues until the end of the rib cage, where the T12 vertebra joins with the first vertebra of the lumbar region. Thoracic disc herniation is a medical condition caused by the bulging or swelling of the pulpous and nerve material, located in the center of the disc. The material squeezes out of its narrow space and becomes exposed. The pressure exerted by the disc on the exposed nerves causes extreme pain to the individual which hampers him in engaging in different everyday activities. 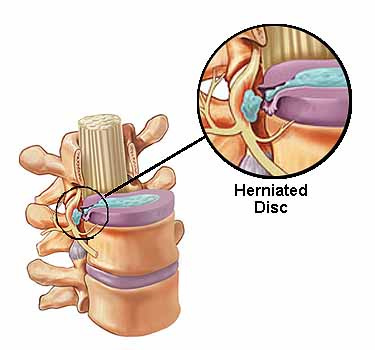 Disc generation is also a probable cause of thoracic disc herniation, as the disc experiences wear and tear due to age and strenuous usage. This medical condition is more likely to develop in individuals who are in the 40 to 60 year age bracket. Medical professionals conduct MRI scans in order to determine that there is no pressure and damage to the spinal cord because of the degeneration of the disc. In extreme cases, where the herniated disc exerts pressure on the spinal cord and the nerves, an individual can even suffer from a paralysis in the lower region of the body. If the disc herniation is more to the side, it might cause pressure or impingement on the nerve root, causing pain in the abdomen and chest walls. In other cases, the pressure on the nerves might cause a combination of different symptoms ranging from upper back pain to tingling sensations all down the spine. Chiropractic offer non-invasive treatment methods for different spine, neck and disc injuries. They provide services for joint adjustment and relief from various musculoskeletal disorders. Chiropractic is gaining popularity for effective treatment of different painful muscle strains and disorders.